Always thought 1.Walk across the ramp with me. Take my hand. Let’s go see the planes. Which one do you want? They’re all so beautiful, it’s hard to pick. I want the shiny one. Why? It the prettiest and looks fast. OK. Which one don’t you want? The one on the end. Why? It’s old and not very shiny. OK. Here let’s stand on this ladder to get a better view. We can take a picture. Climb up a rung with me. Now look again. What do you see? A bunch of wings. Good. The airplanes parked together make kind of a pretty pattern, don’t they? Like the wings are holding hands. Yes. Do they look so different from up here? No. Good. Let’s go up one more rung. There, that’s the view I want you to see. Look how respectful people are around the planes. Admiring, smiling, taking pictures, watching over them. Hands gently touching wings, the wings touching each other. What do they all have in common? They all love airplanes? Good. Do you see a difference in the old one from the shiny one up here? No. They all look beautiful from up here don’t they? Yes. Why? Because they all can fly. Good. What about the people? How are they like the planes? They can all fly too. Excellent. Now we share the same view. “Don’t you leave me Goose. Don’t you leave me.” My first teacher was now my wingman. Neither of us were Maverick’s. We were two of the biggest chickens on the American Barnstormers Tour and proud of it. Goose’s. A freudian slip of my wingman’s tongue. I was his Radar Intercept Officer that day. We were on top of a layer of clouds flying from Burlington, IA to Freeport, IL He was in the New Standard with only a bubble compass. I was in Blu with a vertical compass, electric turn coordinator, and loads of instrument time. We left that morning with Barnstormer’s bravado. Pork Chop, our ringleader, calling Burlington CTAF, “Barnstormer flight of 16 departing to the Northeast.” We had a show to do and “the show must go on” on Tour. Sixteen vintage planes, flying in trail up the center of the highway just below the overcast. That morning I had forgotton ‘the cop’ was in my front seat. Once the weather opened up, the faster planes went up with it. The Waco’s and Speedmail left the circus and the slower planes paired off. Two by two we made our way toward Freeport and I got to know ‘the cop’ in my front seat. He was a seasoned detective, a 27 year veteran, who dreamed of being a professional writer. All buttoned up and reserved, his exterior loosened as he talked boyishly about writing and his love of airplanes. ‘The cop’ told me he wanted to write his own book. Someday. He was working three jobs; detective, freelance writer, and raising a family simultaneously. A Frank Furillo busy keeping all his precinct’s together. Worrying about What would Frank do, instead of doing what he wanted to do. The cop in my front seat was in for quite a wild day with the Barnstormers. 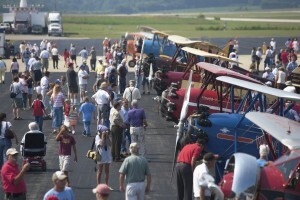 I was flying with Waldo in the New Standard and I had pulled back my power for him to keep up with the Stearman. The clouds weren’t lifting and dodging cell towers is not fun. Waldo, ‘the cop’, and I were on top of a scattered layer and the clouds started closing in below us. Turning our sky into a layer cake and the icing was getting gray. The icing was starting to melt. We were above a sloping cloud deck. Not a good place for VFR equipped airplanes. Two little biplanes making our way in a sky that was slipping to one side. Waldo was scared, I was scared, and ‘the cop’ in my front seat was scared too. “Don’t you leave me Goose. Don’t you leave me,” Waldo said. I replied, “Look at me. Fly off my wing. Keep your eyes on me.” I lit up Blu like a Christmas tree. Strobe and nav lights on. We talked nonstop the whole time. It got grayer and grayer until we couldn’t stand it anymore. Enough. We had to land. We found a hole in the sky to spiral down through. Came out in a tiny space between the green and the gray. A wedge of light that looked like safety. We looked around. There were candy colored planes dropping in from the clouds. Falling down all around us. Each one looking to roost too. Our ringleader was among them. Pork Chop called out on five fingers, 123.45. Barnstormers get in trail. He called to a duster strip on CTAF. “Flight of…? Barnstormers… landing.” It was starting to rain. We could barely see the planes in front of us. All moving in trail. We had to land. It wasn’t an option. I came in behind the big Travel Air 4000 in the rain and we hurried to cover the planes. I looked for ‘the cop.’ He was nowhere to be found, then he came up to tell me he had got a car to pick him up. He needed to get back to work. Had he taken the day off to play with the Barnstormers, he would have seen the day had a happy ending. The airport owners called the neighbors to bring a gaggle of cars to take us to breakfast at the local bowling alley. The newspaper came out and took pictures of the planes in the rain. We told stories and jokes. Napped and read. There was nothing we could do but wait for the weather to improve. When it did some went on to Freeport and the remaining chickens decided to stay put. We’d catch up to the tour the next day. You learn a lot of patience barnstorming. We were tired and needed to recharge. We went out to dinner, drank pitchers of margaritas and laughed. Oh, did we laugh. It is one of my favorite memories from the Tour’s. ‘The cop’ in my front seat and I have been friends for a very long time. Almost ten years. He came to sit with me at Sun-n-Fun in 2012, when Buddy’s restoration was completed. Still working three jobs and still a detective keeping his precinct’s together. He didn’t like his day job and seemed pretty blue. I told him I had a present for him. A clock. A bronze Richfield Oil clock from the 1930’s. I said, “Tick-tock my friend. You told me you wanted to be a professional writer and a published author. I believe you can do it. Maybe this clock will remind you to believe it too.” ‘The cop’ retired from the police force in 2014. 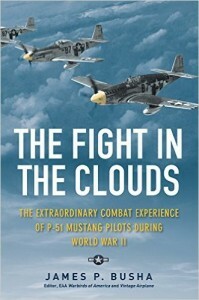 Author, Jim Busha is now Director of EAA Publications and a professional writer with his own book.